Audie M. Toussant, age 61, of Maximo, loving son, father, and grandfather, passed away Monday, January 21, 2019, peacefully in his home. Audie was born March 30, 1957, in Alliance, to Eugene and MaryLou (Smith) Toussant. He was baptized on April 14, 1957 at St. Joseph's Church in Maximo. 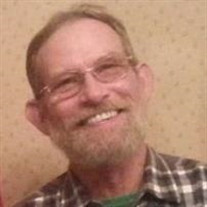 He was a former machinist for Hercules Manufacturing in Massillon and worked for Clover Machine in Alliance for the last 12 years. Audie was a dedicated, hard worker, and in his free time enjoyed spending time with beloved dog, Max, his friends and family, and enjoyed golfing, nature and listening to music. Audie leaves behind his daughter, Ashley Toussant of Wadsworth; two step-daughters, Mae Gray of Springdale, PA, and Angela Bartley of Columbiana; his mother, MaryLou Toussant of Maximo; two brothers, Terry Toussant of Maximo and Tracy (Ellen) Toussant of Hartville; five grandchildren, Ava Godenswager, Tessa and Kora Hobson, Veroniqua and Brad Bartley Jr; and one great-grandchild, Frank Copanic III. He was preceded in death by his father, Eugene J. Toussant. Friends may call Friday evening, from 5-8 p.m. January 25 at Cassaday-Turkle Christian Funeral Home in Alliance, where a memorial service will be held the following morning at 10:30 a.m. Saturday, January 26.